By Sharon Kreuer, D.O., Megan Elgethun, M.D., Matthew Tommack, D.O. 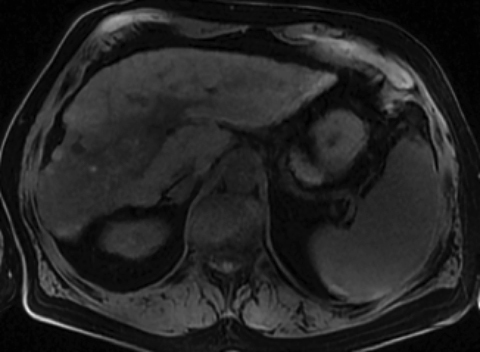 Cirrhosis and its sequela are common imaging findings in outpatient and emergent settings. 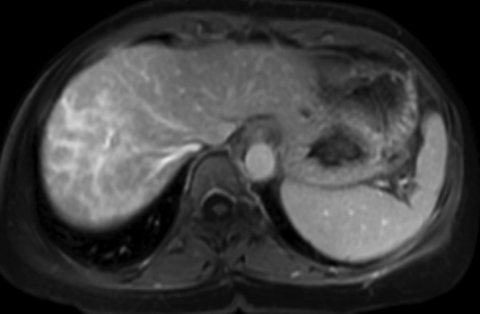 It is important for the radiologist to identify primary and secondary findings associated with cirrhosis, as well as evaluate for development of hepatocellular carcinoma (HCC). Distortions in morphology and alterations in parenchymal enhancement secondary to cirrhosis, however, can make the detection of hepatic masses difficult. In addition, the differentiation between benign and malignant lesions can be challenging in a cirrhotic patient and have significant consequences for treatment management. Knowledge of characteristic imaging findings that help distinguish between benign and malignant lesions is essential to accurate image interpretation. 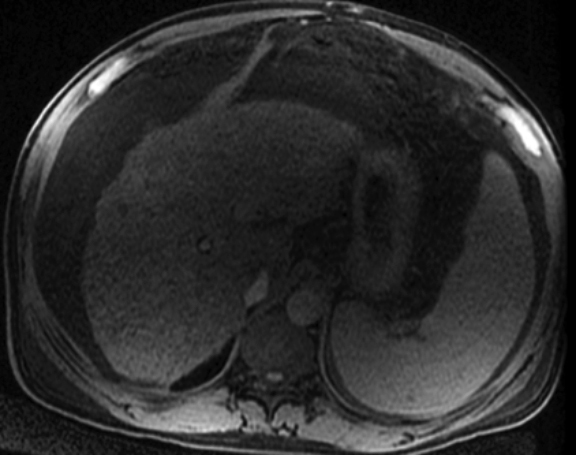 Cross-sectional imaging such as computed tomography (CT), MR, and ultrasound are the most frequently used modalities to assess and follow patients with cirrhosis. 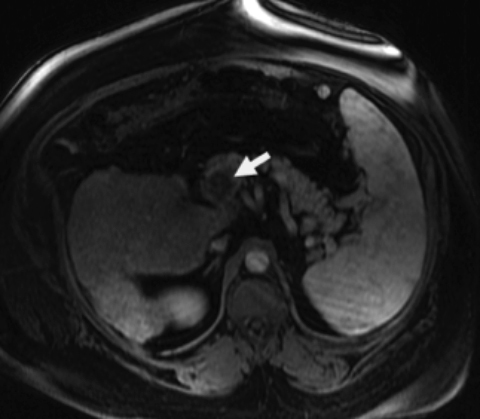 In this article, we discuss common imaging findings of cirrhosis across all modalities and address imaging classification systems where applicable. Advanced cirrhosis causes several overt alterations in the morphology of the liver. 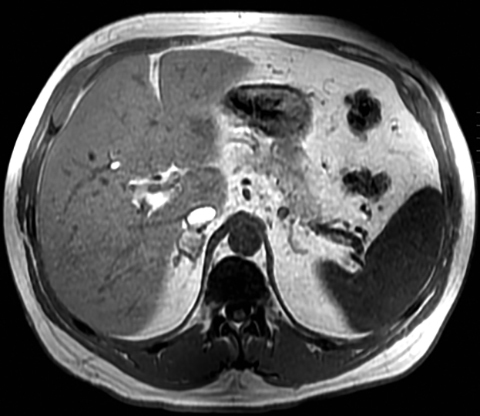 Hepatic surface nodularity is common in cirrhosis, and although not pathognomonic, it is thought to be a relatively specific sign. The cause of this irregularity is alternating areas of necrosis and regenerative nodules. Necrosis results in varying degrees of fibrosis with collapse of the underlying liver parenchyma and capsular retraction, while regenerating nodules cause random areas of contour bulging.2 In macronodular disease, the characteristic surface nodularity is typically present (Figure 1). However, with micronodular disease, the hepatic surface may be smooth or nodular.3 Linear array transducers can provide high-resolution images of the capsule of the liver, allowing for close assessment of nodularity in subtle cases. As a caveat, while increased surface nodularity is specific when used with other imaging and clinical findings, it may not always be attributable to cirrhosis. Disease processes such as peritoneal seeding, subcapsular metastasis, sarcoidosis, post-treatment changes, and pseudomyxoma peritoni may result in contour deformity of the liver, mimicking cirrhosis. In cases of severe end-stage cirrhosis, the liver often has a conspicuous appearance of being diffusely atrophied. However, the goal is to be able to recognize subtle alterations in liver morphology in the setting of early cirrhotic changes. 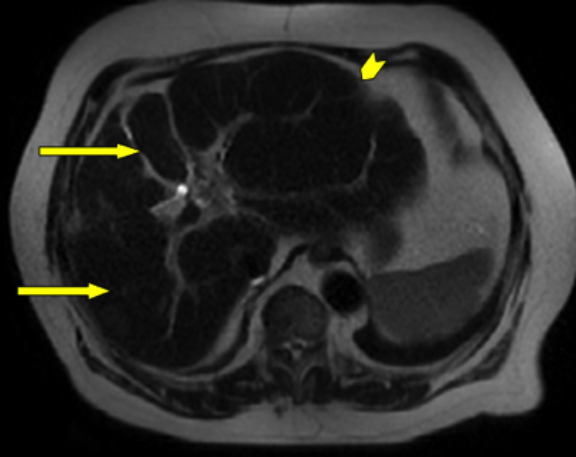 A common imaging pattern in the setting of cirrhosis includes a lobar atrophy-hypertrophy complex with right lobe and medial segment volume loss and enlargement of the lateral segment and caudate lobe (Figure 2). In general, this is reflected in the caudate-to-right-lobe ratio where a transverse measurement of > 0.65 is considered abnormal; however, there are variations in this pattern based on the etiology of the cirrhosis.4,5 It is theorized that this pattern of atrophy and hypertrophy is due to segmental alterations in the portal blood flow to the liver secondary to venous compression by fibrosis and regenerative nodules.6 This atrophy-hypertrophy complex gives the appearance of widening of the hepatic fissures and increased fat within the porta hepatis. 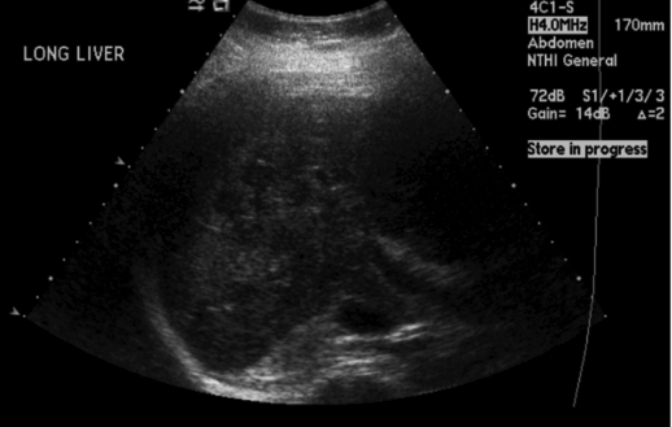 Coarsened echotexture and changes of hepatic steatosis can be subjective ultrasound findings in chronic liver disease, often easier to delineate on cross-sectional CT and MRI. 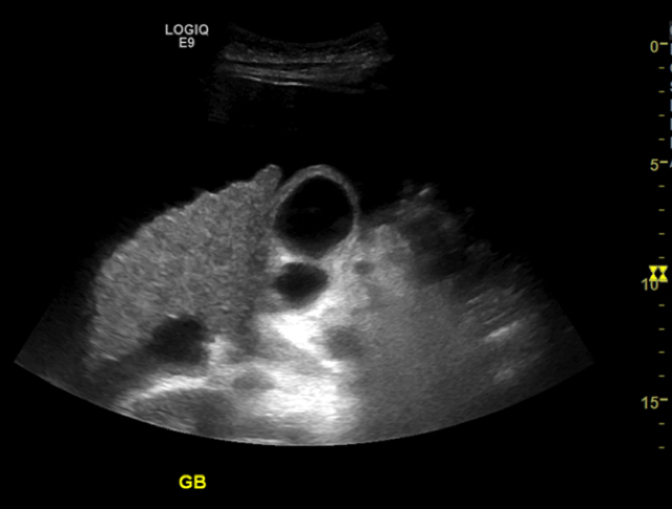 On ultrasound, the liver appears diffusely hyperechoic with internal reference made to the renal cortex and splenic parenchyma (Figure 3). 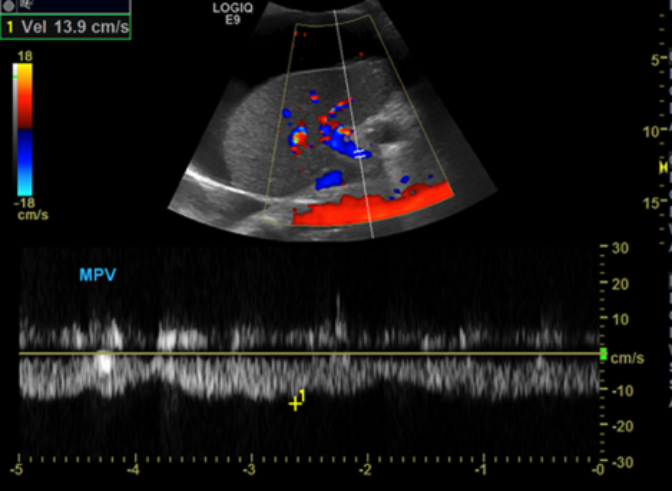 Focal fatty sparing, which appears hypoechoic in relation to the remainder of the liver, can be seen in areas of alternative regional blood flow, such as adjacent to the gallbladder fossa. Additionally, impaired acoustic penetration limits visualization of the portal triads, diaphragm, and posterior portions of the right lobe. On CT, an objective measurement using Hounsfield units of < 48 on a noncontrast study is most accurate in diagnosing hepatic steatosis. Comparison to the attenuation of the spleen on contrast-enhanced study can also be used; however, this is less reliable. Although more commonly diffuse, when focal fat infiltration is present in the setting of cirrhosis, it should appear geographic without mass effect. MRI demonstrates signal loss on T1WI opposed-phase GRE images (Figure 4). Portal hypertension is defined as elevated blood pressure in the portal venous system. The portal venous system is comprised of merging veins from the pancreas, spleen, intestines, and stomach to form the main portal vein. The main portal vein then enters the liver at the porta hepatitis and divides into smaller branches. It serves as the main blood supply to the liver. In cirrhosis, when the liver parenchyma becomes fibrotic and noncompliant, there is gradually increasing resistance to blood flow into the liver. Specifically, the resistance to flow occurs to the greatest degree at the level of hepatic venules and distal sinusoids.7 As a result, pressure in the portal veins increases, leading to portal hypertension and its sequela. Although the most common cause of portal hypertension is cirrhosis, other causes include hepatic venous outflow obstruction or extrahepatic portal vein thrombosis or compression. Additional findings of portal hypertension that can be seen with multiple modalities include portosystemic collateral shunting, ascites, and splenomegaly. In an effort to decompress the elevated pressures and resistance within the portal venous system, portosystemic collateral vessels develop spontaneously. Periesophageal, perisplenic and perigastic varicies are common as are omental collaterals with recanulization of the umbilical vein (Figure 7). These portosystemic shunts predispose patients to an increased risk of variceal bleeding and higher mortality. Ascites develops in patients when the portal venous pressures exceed 12 mmHg. This is largely due to increased intravascular hydrostatic pressure coupled with decreased oncotic pressure. 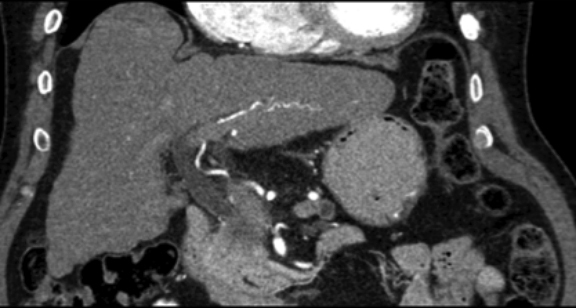 Splenomegaly is a result of portal congestion, tissue hyperplasia, and fibrosis. The enlarged spleen requires increased blood flow, which further perpetuates the underlying portal hypertension. A complication of advanced portal hypertension is portal venous stasis, which can result in bland thrombus formation. On ultrasound, portal vein thrombosis is demonstrated when there is lack of venous flow on spectral or color Doppler imaging.8 A caveat to this is a false positive imaging finding that occurs when sluggish flow results in a lack of Doppler signal. 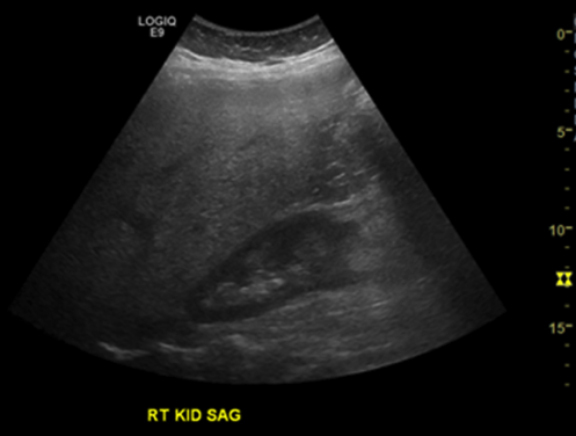 Thrombus may also be seen as an echogenic filling defect within the main portal vein or branches of the intrahepatic portal veins on grayscale imaging (Figure 8). 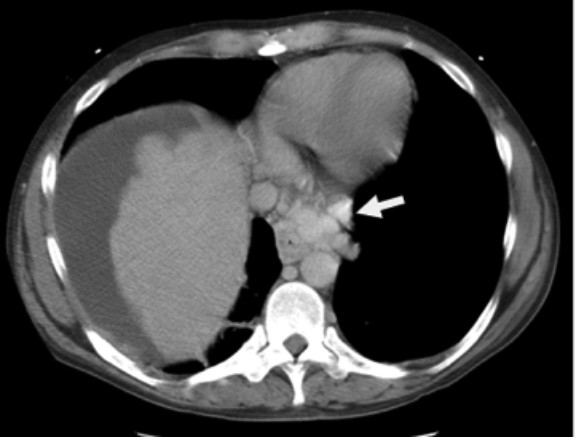 On contrast-enhanced CT or MRI, a nonenhancing filling defect within the portal vein is compatible with bland thrombus (Figure 9).8 Without IV contrast, the evaluation for thrombus is limited. If the thrombus is subocclusive, flow may be seen around the thrombus. In the setting of cirrhosis, fibrosis is typically demonstrated as progressive enhancement that peaks during the late venous/equilibrium phases. There is typically minimal or no enhancement during arterial or early venous phase imaging. Fibrosis may present as enhancing septa and bridges, or demonstrate a more confluent pattern. Confluent fibrosis is more common in alcohol-related cirrhosis as compared to viral liver disease. 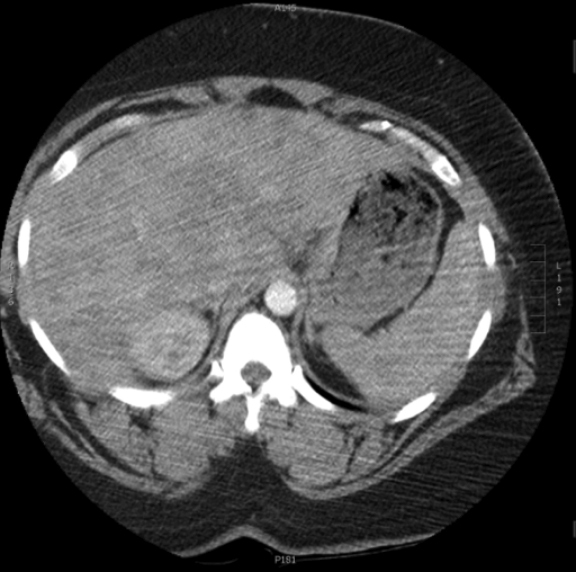 It appears as wedge-shaped, geographic areas of enhancement with straight or concave borders that radiate from the portal hilum to the liver surface, often resulting in retraction of the adjacent hepatic capsule (Figure 10).9 More focal areas of fibrosis may demonstrate arterial hypervascularity, which can mimic hepatocellular carcinoma. This pattern of fibrosis can often be distinguished from hepatocellular carcinoma by its characteristic wedge-shaped configuration and by enhancement persisting into the late venous phases. An end-stage complication of cirrhosis is the development of hepatocellular carcinoma (HCC). 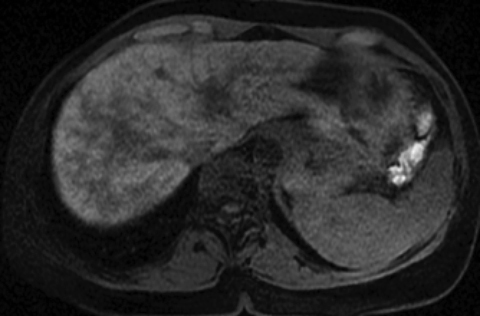 In fact, cirrhosis is the strongest risk factor for development of HCC, with approximately 80% of all HCCs associated with cirrhotic livers.10 For patients with cirrhosis (of any cause), imaging plays a large role in surveillance and management. As opposed to most cancers that require histologic confirmation for diagnosis, in certain high-risk populations HCC is commonly diagnosed on imaging. 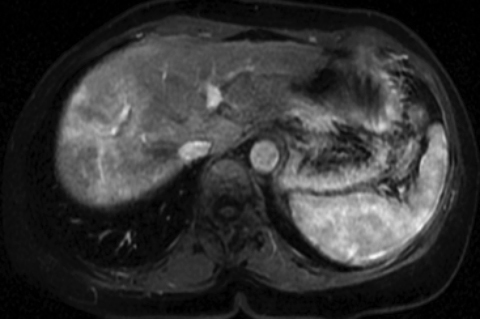 Hepatocellular carcinomas may manifest as a solitary mass (approximately 50% of the time), multiple masses, or with diffuse involvement of the liver. Large solitary lesions (> 2 cm) that demonstrate typical imaging features are often readily diagnosed. 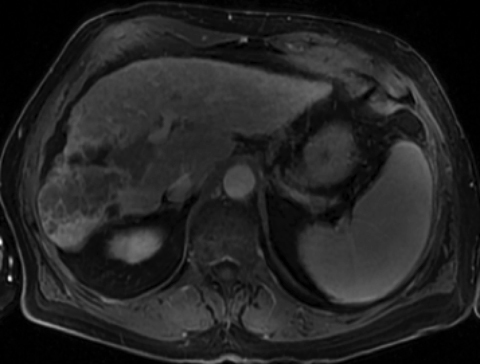 However, a diffuse carcinoma superimposed upon architectural distortion caused by cirrhosis can be far more challenging to diagnose based on imaging features alone. Ideally, at-risk patients are identified early and undergo routine surveillance. Surveillance usually begins with ultrasound and monitoring of alpha-fetoprotein levels. If a focal lesion > 1 cm is identified on ultrasound in a cirrhotic patient, dynamic contrast-enhanced CT and/or MRI is the next step. Ultrasound characteristics of HCC are nonspecific and cannot be reliably differentiated from a regenerative nodule. Nodules < 1 cm can be followed with ultrasound at 3-month intervals until 2 years of stability are shown.11 If interval growth is demonstrated, a dynamic contrast-enhanced CT or MRI is needed for further evaluation. Dysplastic nodules are typically hypoattenuating on unenhanced and all dynamic contrast-enhanced phases. On MRI, dysplastic nodules are iso- to hyperintense on T1 and iso- to hypointense on T2 sequences. The increased T1 signal intensity results from fat or copper deposition or tumoral bleeding. This T1 hyperintensity can be seen in either dysplastic nodules or HCC. Rarely, dysplastic nodules are hyperintense on T2 sequences, also making it difficult to distinguish them from HCC, which also generally demonstrates increased T2 signal. Most dysplastic nodules have relatively normal arterial supply; therefore, they are isointense to the liver parenchyma in the late arterial phase.12 Occasionally, a high-grade dysplastic nodule can show hyperenhancement in the arterial phase, as would be seen with HCC. However, dysplastic nodules usually do not demonstrate the typical washout pattern or have a capsule, as is seen in HCC. HCCs demonstrate arterial phase hypervascularity due to neoangiogenesis and dominance of tumor blood supply from the hepatic arterial system. This is in contrast to the surrounding normal liver parenchyma, which receives its dominant blood supply from the portal venous system. As the normal hepatic parenchyma enhances more in the portal venous phase, the tumor appears hypoenhancing due to its lack of portal venous blood supply. 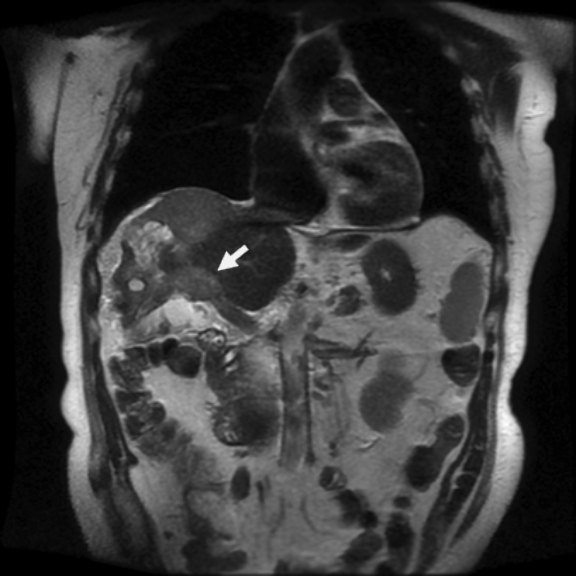 This may be evident in the portal venous phase or may only be seen during further delayed imaging (Figure 12).11 Another characteristic feature of HCC is the appearance of a capsule or peripheral rim enhancement in the portal venous or delayed phases.12 On MRI, HCC classically restricts diffusion and has increased T2 and decreased precontrast T1 signal intensity. Occasionally, HCC may show increased T1 signal intensity, similar to dysplastic nodules. As discussed, the pathogenesis of cirrhotic nodules to the development of HCC is a continuum. Therefore, imaging characteristics of the various entities may overlap. 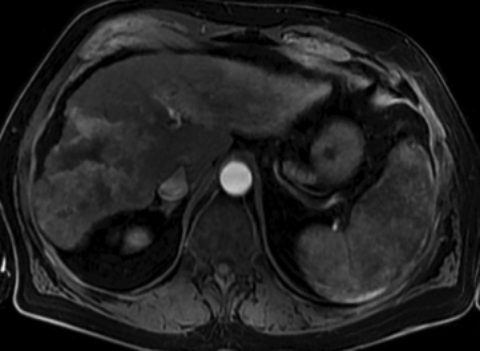 The Liver Imaging Reporting and Data System (LI-RADS) has recently been developed to assist radiologists and clinicians in decision-making when assessing suspicious nodules within the cirrhotic liver (Figure 13). 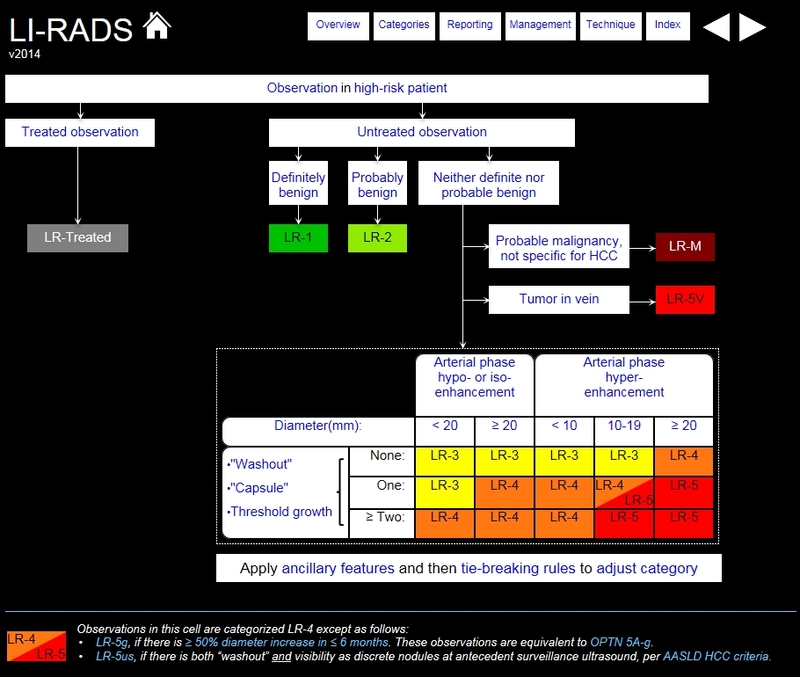 The decision tree categorizes lesions based on the probability of malignancy using signal characteristics, lesion size, presence of a capsule, interval growth, and enhancement characteristics as its main criteria.14 Separate categories were created for previously treated lesions and for tumor extension into the vein.14 LI-RADS also reviews recommendations regarding diagnostic follow-up for radiology reporting. Diffuse surface irregularity is most often seen in a cirrhotic liver. However, there is a short list of differential considerations based on the presence of coarse or fine surface nodularity, with the latter being more difficult to distinguish from cirrhosis. Causes of coarse lobulation include chronic Budd-Chiari syndrome, portal vein thrombosis, and pseudomyxoma peritonei.15 Causes of fine diffuse nodularity include “pseudocirrhosis” of treated breast cancer metastases, fulminant hepatic failure, military metastases, and sarcoidosis (Figure 15).15 A review of relevant clinical information can usually aid in arriving at the correct diagnosis. 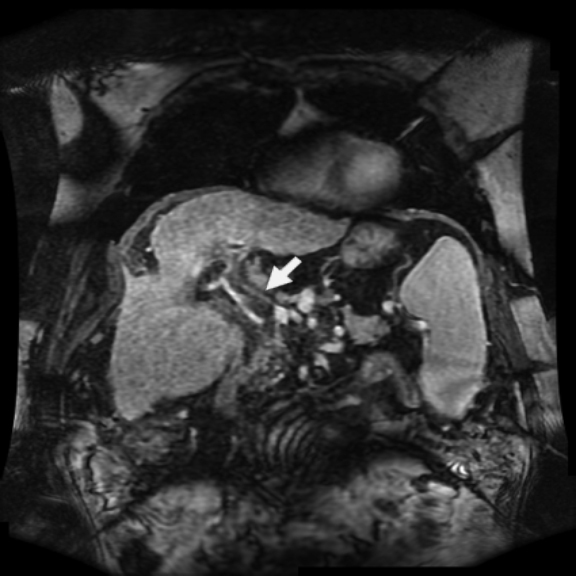 Cirrhosis and its sequela are encountered commonly not only by abdominal imagers, but also by general radiologists. It is therefore important to understand the underlying pathophysiology of cirrhosis, as well as be able to concisely convey to clinicians important imaging findings, particularly those that would alter patient management. A foundational understanding of the multitude of changes that can be seen with cirrhosis will better equip the radiologist to paint a comprehensive picture of the disease process and detect and properly characterize benign and malignant lesions commonly associated with cirrhosis. This will undoubtedly have a profound effect on a patient's management and treatment. Goodman, ZD. Grading and staging systems for inflammation and fibrosis in chronic liver disease. J Hepatol 2007;47(4):598-607. Poff JA, Coakley FV, Qayyum A, et al. Frequency and histopathologic basis of hepatic surface nodularity in patients with fulminant hepatic failure. Radiology 2008;249(2):518-523. Dodd GD, Baron RL, Oliver JH, et al. 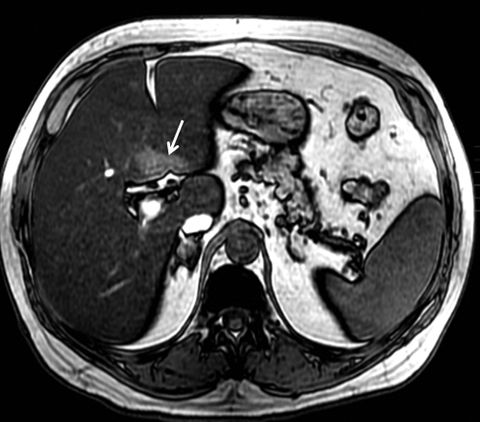 Spectrum of imaging findings of the liver in end-stage cirrhosis: part I, gross morphology and diffuse abnormalities. Am J Roentgenol 1999(173):1031-1036. Harbin WP, Robert NJ, Ferrucci JJ. Diagnosis of cirrhosis based on regional changes in hepatic morphology: a radiological and pathological analysis. Radiology 1980(135):273-283. Heller MT, Tublin ME. 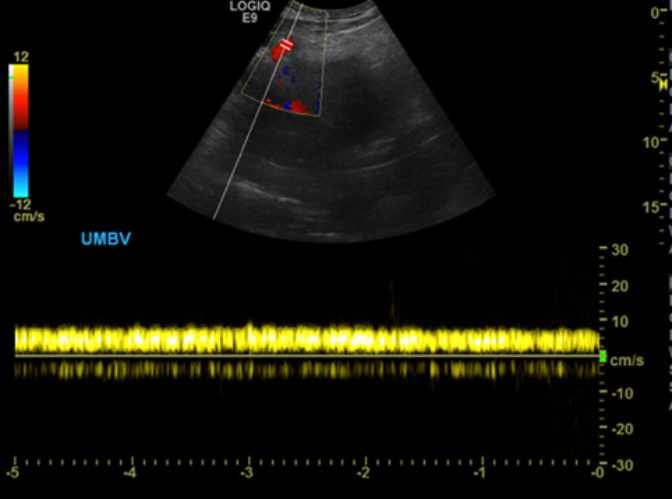 The role of ultrasonography in the evaluation of diffuse liver disease. Radiol Clin N Am 2014;52(6):1163-1175. Awaya H, Mitchell DG, Kamishima T, et al. Cirrhosis: modified caudate-right lobe ratio. Radiology 2002;224(3):769-774. Wachsberg RH, Bahramipour P, Sofocleous CT, et al. Hepatofugal flow in the portal venous system: pathophysiology, imaging findings and diagnostic pitfalls. RadioGraphics 2002;22(1):123-140. Parvey HR, Raval B, Sandler CM. 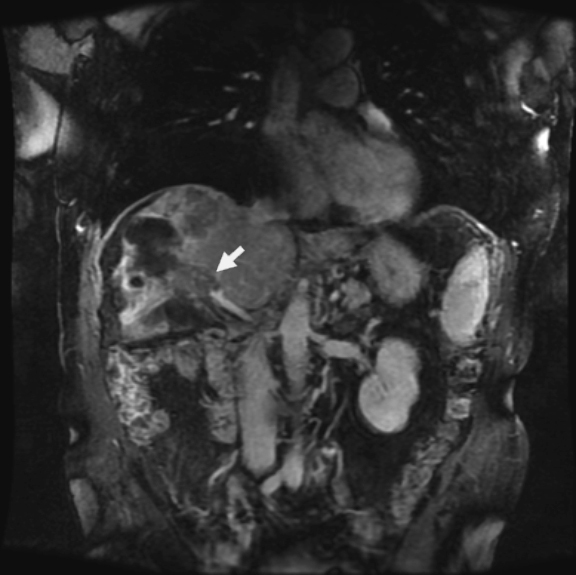 Portal vein thrombosis: imaging findings. Am J Roentgenol 1994;162(1):77-81. Faria SC, Ganesan K, Mwangi I, et al. MR imaging of liver fibrosis: current state of the art. RadioGraphics 2009;29(6):1615-1635. Willat JM, Hussain HK, Adusumilli S, et al. 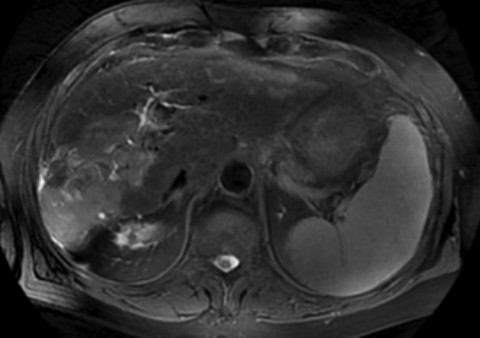 MR imaging of hepatocellular carcinoma in the cirrhotic liver: challenges and controversies. Radiology 2008;247(2):311-330. McEvoy SE, McCarthy CJ, Lavelle LP, et al. Hepatocellular carcinoma: illustrated guide to systematic radiologic diagnosis and staging according to guidelines of the American Association for the study of liver diseases. Radiographics 2013;33(6):1653-1668. Choi JY, Lee JM, Sirlin CB. 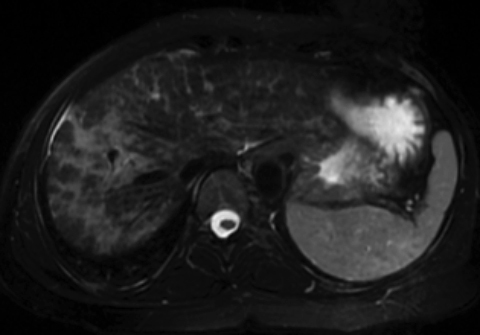 CT and MR imaging diagnosis and staging of hepatocellular carcinoma: part I. development, growth and spread: key pathologic and imaging aspects. Radiology 2014;272(3):635-654. Hanna RF, Aguirre DA, Kased N, et al. Cirrhosis-associated hepatocellular nodules: correlation of histopathologic and MR imaging features. RadioGraphics 2008;28(3):747-769. American College of Radiology. Liver Imaging Reporting and Data System version 2014. http://www.acr.org/Quality-Safety/Resources/LIRADS. Accessed January 11, 2016. Jha P, Poder L, Wang Z, et al. Radiologic mimics of cirrhosis. Am J Roentgenol 2010;194(4):993-999. Kreuer S, Elgethun M, Tommack M. Imaging Findings of Cirrhosis. J Am Osteopath Coll Radiol. 2016;5(2):5-13. Sharon Kreuer, D.O., Megan Elgethun, M.D., Matthew Tommack, D.O. Dr. Kreuer and Dr. Elgethun work with the Department of Women's Imaging, Kettering Health System, Dayton, OH and Dr.Tommack works with the Department of Abdominal Imaging, University of Pittsburgh Medical Center, Pittsburgh, PA.